Super! I plan to use the upcoming set "Taking prisoners". Nearly finished!! The heraldry...I think I´ll stick to transfers and prints in the future..it nearly made me go blind trying to paint so small! 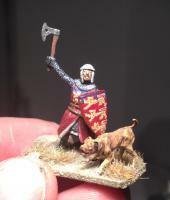 Well really great work... also I must admit that your work did inspire me, so I did choose also to do a knight with a dog. I have called my diorama "Protect the King"
Come on...one day to go!!! !